We have released Mobile Joomla! 1.1.1 today. With the device detection library updates, for example, Android 4.0+ devices are now recognized correctly. Updated the AMDD device detection library: over 900 devices, browsers and bots were added/updated. As always, you can update to the new version from your administrative panel via Mobile Joomla! Remote Update feature, or by downloading Mobile Joomla! 1.1.1 package and installing it from the back-end. Do not forget to backup your website before the upgrade! Read more about Mobile Joomla! Pro. 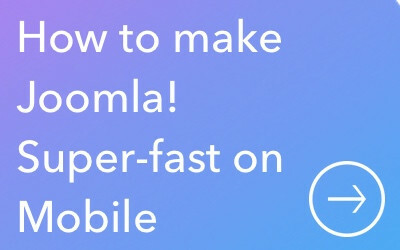 Supercharge Your Mobile Site: Mobile Joomla! Pro & Mobile Joomla! Club Are Here! We have worked really hard for a long time. Now we couldn't be happier to finally release Mobile Joomla! Pro and Mobile Joomla Club for you to take your mobile world to the next level! Mobile Joomla! Pro includes advanced features for those who want more features and better performance: Remote device detection, iPad support, Online device simulator, Backup & restore and more, all included in this amazing product. No more large database space needed: Remote Device Detection doesn't require manual updates, and makes sure your mobile website always supports latest devices. What's more, for those who want it all inclusive we have launched a special subscription package: Mobile Joomla! Club, which includes Mobile Joomla! Pro, Elegance Mobile Joomla! Template, JComments Mobile and Kunena Mobile Extensions, in addition to all free Mobile Joomla! extensions! Check out the Mobile Joomla! feature comparison chart. To celebrate our biggest launch to date, we have arranged some crazy launch specials! Purchase Mobile Joomla! Pro or Club and receive massive value pack! 25% discount on JoomlaBlogger's brand new ebook Blogging With Joomla! We'd like to thank all our friends who help us to bring this crazy launch specials to you! AcyMailing is a Joomla! component allowing you to maintain real communication with your contacts via e-mail marketing, newsletters, follow-up autoresponders, marketing campaigns, etc. It is seamlessly incorporated into Joomla and provides professional features enabling you to keep you in permanent contact with your subscribers. Have you struggled with similar extensions in the past? AcyMailing will save you time and make your life easier. CloudAccess.net - Your Joomla! site launched instantly. Just find a domain and go! CloudAccess offers Joomla! Platform-as-a-Service. You get hosting on premium equipment, managed backups, Joomla! phone support, email, and lots more. Joomla-Monster.com is a unique online store for Joomla! end-users but, thanks to different subscription options, it becomes a really attractive platform for Joomla! based websites developers. Quality of our templates together with their functional capabilities can be appreciated while viewing their demo versions and tutorial movies. Our offer is varied and everyone will find something for themselves. Frequent and generous discounts are also worth mentioning. OSTraining provides online, in-classroom, and on-site training for Joomla and more. Over 7,000 members learn with OSTraining online with a 1, 6, or 12 month subscription. OSTraining specializes in explaining Joomla in terms that anyone can understand. If you've ever struggled to learn Joomla, OSTraining is the answer with hundreds of videos and friendly support staff to answer all your questions. Admincredible is one dashboard for all your Joomla 2.5 and 3 sites. Whether you have 5 Joomla sites or 500, you monitor them and update them with just one click of a button. JoomlaBlogger is the site for Joomla! news and information since 2009. The brand new Blogging With Joomla! ebook reveals all the secrets learnt about using Joomla as a blogging platform also for numerous client sites. This knowledge can be used by anyone using Joomla!, not just those who want to build a blog. Now download Mobile Joomla! and go check out Mobile Joomla! Pro product page for documentation and FAQ. If you have questions we are there to answer all your questions at Presales Forums before you buy Mobile Joomla! Pro. Are you ready for the mobile Joomla! extravaganza?! Yesterday we launched Elegance Mobile Joomla! Template major 1.1 update and new Google Maps for Mobile Joomla! extension along with Kunena and JComments extension updates. Now we are getting ready to launch Mobile Joomla! Pro packed with all advanced features like Remote device detection, iPad support, online device simulator, backup & restore and more, with this crazy launch special deals and contest! Celebrating our biggest launch to the date, we are offering crazy launch special deals! Be among the first 20 purchasing Mobile Joomla! Pro & receive crazy free pack! If you are among the first 20 customers to purchase Mobile Joomla! Pro, you will get the crazy value pack, worth hundreds of dollars! (applies to any Mobile Joomla! Pro plan, but offer package limited to 1 per customer). Purchase Mobile Joomla! Pro and receive massive value pack! Update July 10th: The competition is now over - big thanks to all who participated! The winner drawn was @sweup, congrats! We are also running a crazy competition where you can win a free Mobile Joomla! 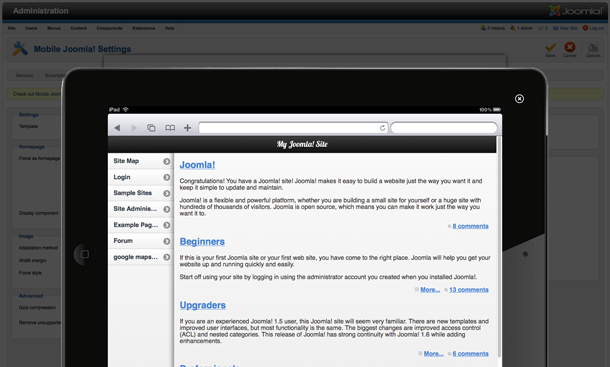 Pro license + free access to all Mobile Joomla! premium extensions and templates + crazy free pack above! Only thing you need is a valid Twitter account. The contest will run until Monday July 9th, 23:59 PST. We will announce the winner on Tuesday 10th. We will randomly draw the winner in our sole discretion from legitimate entries and contact them via Twitter direct message. Elegance Mobile Joomla! Template major 1.1 update was not the only news we wanted to give you today! Here is the new member of Mobile Joomla! Extensions and templates family: Google Maps Mobile Joomla! Extension. 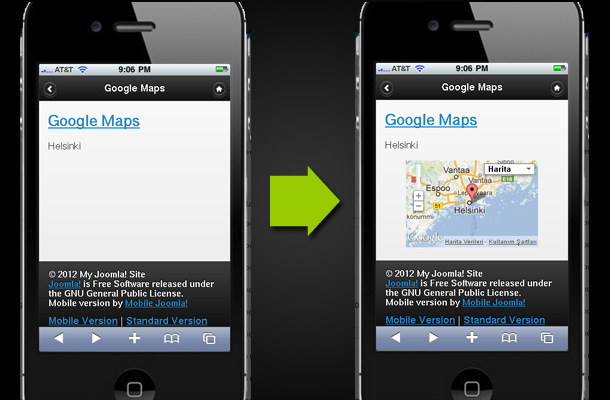 Google Maps Mobile improves compatibility of third party Joomla extensions for Google Maps on Elegance Mobile Joomla! template, without configuration or changes to your existing content. No need for any setup: You install, it just works! Best of all is Google Maps Mobile Joomla! Extension is free for Elegance Mobile Joomla! template owners! Following major Elegance Mobile Joomla! 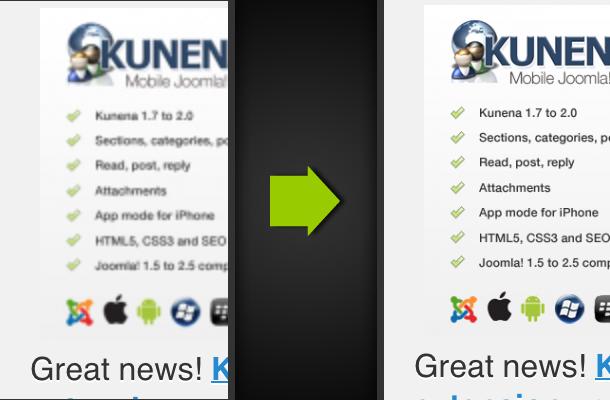 template 1.1 update, our highly popular extensions Kunena Mobile Joomla! extension and JComments Mobile Joomla! extensions are also updated! If you upgraded your Elegance Mobile Joomla! template and use these extensions, do not forget to upgrade them as well. Have you heard about Mobile Joomla! Pro? If you have missed the news, we just announced the Mobile Joomla! Pro. Remote device detection, iPad support, online simulator, backup & restore, all packed into Mobile Joomla! Pro. We will reveal some exciting stuff tomorrow about it! Happy Independence Day to all our U.S. friends! We haven't stopped for the summer and keep on working hard: Let the new updates & improvements keep rolling in! This time we would like to announce that we just released a major update 1.1 to Elegance Mobile Joomla! template! There are enough improvements there that some guys might have released a whole new template, but we have included everything into Elegance - so if you purchased Elegance Mobile Joomla! template earlier, you will get all of these new features for free! 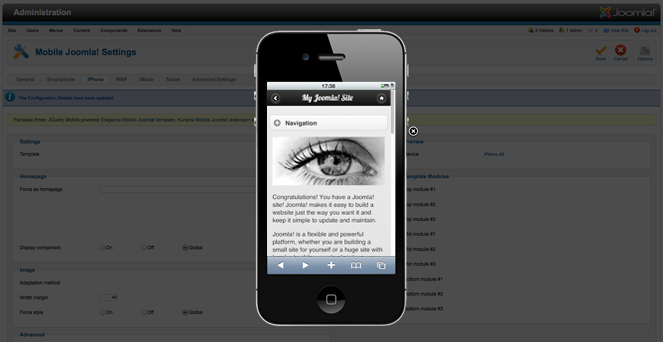 If you haven't got the JQuery Mobile and HTML5 powered Elegance Mobile Joomla! template yet, check out our previous showcase interview and use your phone to visit some of these sites that use Elegance. Mobile Joomla! - Mobile Joomla! Elegance 1.1 has native support for themes generated with ThemeRoller for JQuery Mobile. Now you can easily generate your own color themes and use them on your website with Elegance template. Mobile websites should be as agile as possible, so we have significantly improved page loading time. Test on Joomla! 2.5 website with demo data and default Mobile Joomla! 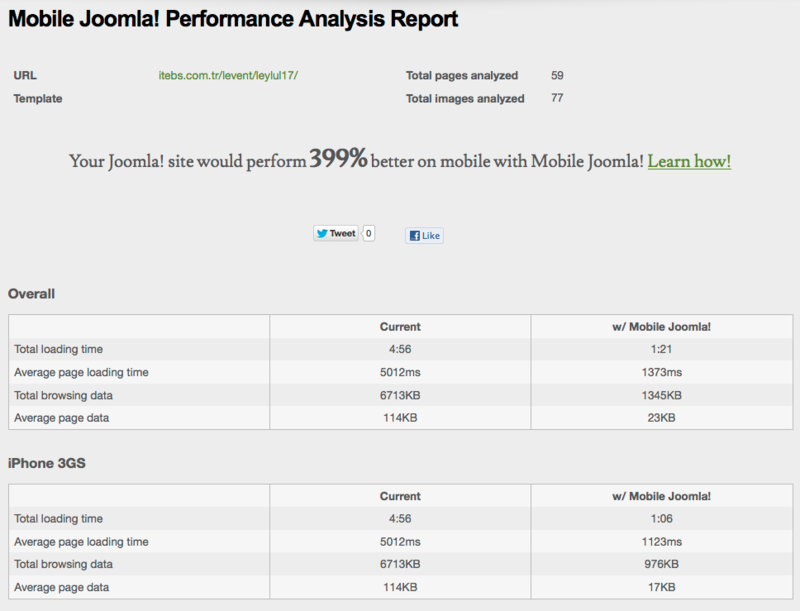 settings shows 20% improvement for first page load, and 60% for subsequent AJAX-loaded pages. 4 new page transition effects are added to Elegance: Flip, Turn, Flow, and Slide Fade. We reworked the AJAX navigation of Elegance to make it faster and more compatible with 3rd party extensions. !! Important note about Upgrading Elegance from 1.0.x to 1.1 !! There should be no problem upgrading Elegance 1.0 to 1.1, but we recommend you to backup your current Elegance template, especially if you have made any significant changes to the JS/CSS files. Also note that if you used custom_preload.txt files, you can remove most or all entries from them, because the updated AJAX navigation loads necessary JS/CSS files on the fly. Ladies and gentlemen, get ready to take your mobile web experience to a completely new level: We are proud to introduce...*drum roll*...Mobile Joomla! Pro! Mobile Joomla! Pro is packed with great new features for our advanced users and will be launched as soon as next week. To get things even crazier, we decided to throw a big launch party together with our good friends. 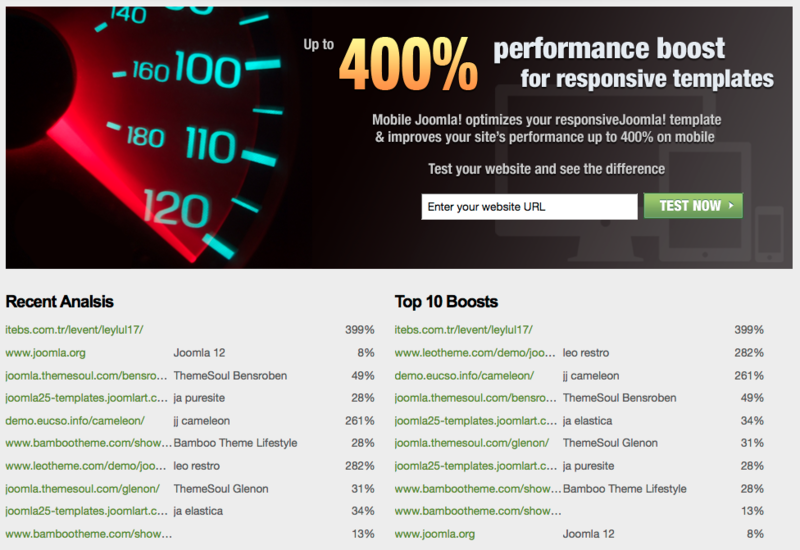 If you act fast, you will not only be amongst those to put hands on Mobile Joomla! Pro, but also enjoy exclusive benefits from some of the top Joomla! companies. We will reveal more about the very special launch offer shortly - follow us on Twitter and Facebook to get the edge! In the meanwhile, let's take a look at some of the Mobile Joomla! Pro features. In the Pro version we have a great number of features that we know our heavy users will appreciate. We've listened to your feedback and needs, and our vision is clear where to take Mobile Joomla!. If there's one thing sure about the mobile market, it is that the rapid change won't slow down. Almost every day there are multiple new devices launching in the market, meaning that you need to do constant updates to your device database to make sure new mobile devices are recognized correctly. However, Mobile Joomla! Pro makes your life a lot easier, using our own server based device detection that always has your back - so you will have guaranteed support for all new devices with no more manual device database updates! Testing mobile websites has always triggered many questions on our forums. We've now implemented a tool that will make it a lot faster and easier to tweak your site - with the mobile device simulators included in the Mobile Joomla! Pro backend you can check how your changes affect your site on the fly! For those who also want to serve a customized template to tablets, we now have the option for you! 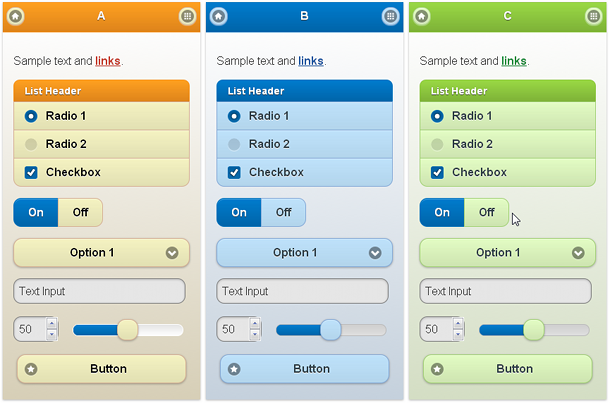 Trigger the switch and Mobile Joomla! Pro will show iPad and other tablets an optimized website instead of your standard desktop site. Apple introduced the hi-resolution "Retina" screens to iPhone and iPad - now you can use hi-res images with Mobile Joomla! Pro without an extra hassle for the greatest user experience. Mobile Joomla! Pro engine takes into account the real screen resolution, so rescaled images will display with the best quality on the device. As you know Mobile Joomla! comes with Support Ads by default at the bottom of each page. In Mobile Joomla! Pro you won't get these ads by default. As a Mobile Joomla! Pro user you will get access to our premium Pro forum to make sure you get the best help for making your mobile website shine.